Ask Linkin Park guitarist Brad Delson for a wish-list of bands hed like to tour with, and hes ready with a response. "We told our manager, Pick a band and we can tour with them. Our music reaches out in so many directions that theres pretty much an unlimited amount of cool bands with which we could play.."
Delson is understandably proud of the diversity and uniqueness apparent on the bands debut album, Hybrid Theory (the bands original name). Built on an aggressive hard rock foundation, flavored with hip-hop vocal styling and electronic flourishes, Linkin Parks sound is utterly their own, an accomplishment strengthened by the bands remarkably powerful and unforced songwriting. But almost everything about Linkin Park has been unforced, including their Southern California origins. Delson and emcee/vocalist Mike Shinoda attended the same high school together, where Delson also met the bands drummer, Rob Bourdon. Shinoda then hooked up with DJ Joseph Hahn while studying painting at the Pasadena Art Center. The final piece in the puzzle was singer Chester Bennington, a transplanted Arizona native who started making records when he was sixteen. "Since I learned how to talk Ive been telling everybody I was going to grow up to be a singer," laughs Bennington. "When I was two, I used to run around singing Foreigner songs theres tapes of me doing that." The combination of Benningtons rich, mammoth vocal style clicked immediately with Shinodas streetwise emceeing. "I think one of Chester and Mikes goals is to be as integrated as possible," offers Delson. "We want our sound to come across so that people go, oh, thats Linkin Park, not I heard this hip-hop part, and now theyre hitting me over the head with this rock chorus. We want everything to have dynamics, but also a continuous cohesive flavor, so that you know what band youre listening to." It was that cohesive style and instantly memorable songs that attracted immediate attention, starting with a publishing offer after the bands very first show at L.A.s famed Whisky. After showcasing around town and eventually inking with Warner Bros., the band began work on their first album with producer Don Gilmore (Eve 6, Lit, Pearl Jam). 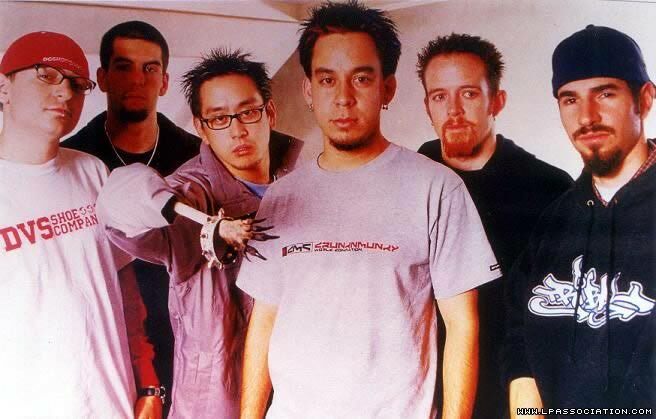 "We met with a lot of people and had a very difficult time deciding," says Shinoda. "But Don, aside from making things sound good, stood out as someone who could really push us further as songwriters. The end result is an album thats as well-crafted and melodic as it is confrontational, with a strong lyrical message. "We try to push real things through in our lyrics; whether its feeling insignificant or questioning your own thoughts or discovering the dark side of yourself." Weaving influences as diverse as Deftones, Nine Inch Nails, Aphex Twin, and The Roots into a single unified whole, Linkin Park and Hybrid Theory are living proof that a fresh combination of talent, an unwavering dedication to craft, and a pure artistic vision can result in a powerful musical statement. "Ive wanted to do this my whole life, and I feel really blessed to be here," says Bennington. "A lot of hard work and dedication and faith can get you through anything and make it happen." Official Bio Written By: Warner Bros.